Four years after appearing the first book edition of the glossariumBITri (gB), it faces now a new phase of development, in which this new book version represents a milestone. The first development phase, 2008-2010, was clearly marked by an intensive cooperative work to stand up the clarification enterprise in which the gB is embarked on. Right after such phase, the gB was nurtured through valuable inputs covering essential aspects as semiotics, computation, complexity, etc., by distinguished researchers who have certainly enriched not only this book but the working team who is now before a more ambitious horizon. Terms included in this glossary recap some of the main concepts, theories, problems and metaphors concerning INFORMATION in all spheres of knowledge. This is the first edition of an ambitious enterprise covering at its completion all relevant notions relating to INFORMATION in any scientific context. 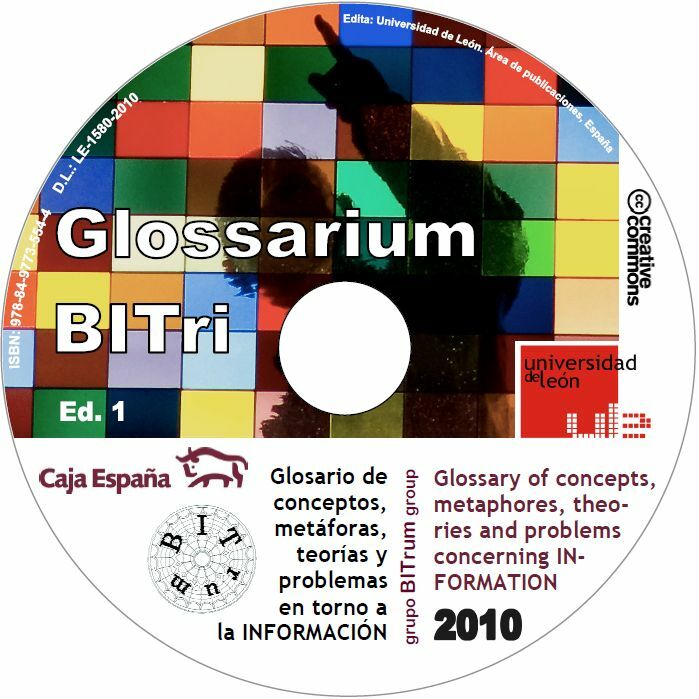 As such, this Glossarium BITri is part of the broader project BITrum, which is committed to the mutual understanding of all disciplines devoted to information across fields of knowledge and practice. This glossary pretends to make explicit the conflicts and agreements among use and meaning of terms related to information phenomena. Information is approached from opposing paradigms and also from competing and cooperating disciplines. Both in science and in ordinary life, conceptual, ethical, technical and societal problems regard information in an essential way. This glossary does not endorse or presuppose any paradigm or any theory, but rather locates into a public, explicit and commonly understandable space some of the crucial assumptions dividing informational concepts, theories, problems and metaphors. Moreover, we purport to embrace all distinct paradigms with a critical and comprehensive attitude. The glossary is the result of an original methodology, which places any entrance under the responsibility of its editor. Authors possibly distinct from the editor contribute to different articles with texts, comments or discussions. Since authors come from many distinct fields of knowledge, each article should reflect many perspectival but rigorous approaches. The glossary is an open work: the number and contents of all its entrances are updated and submitted to revision by editors and authors. For this reason, this first edition is only a first step in the active development of this collaborative methodology. Any interested reader wishing to contribute, may contact the general editors. This glossary is most indebted to the enthusiasm and work of José María Díaz Nafría. The editorial team, authors and correctors thank the Universidad de León and Caja España for their support to this initiative. Contents: Introduction (in English and Spanish), Glossary (in English and Spanish), Indexes, Methodology, Abbreviations, Editorial team.